Joe and Pat planned a full experience on their road trip to see the building exhibit at the Frank Lloyd Wright House in Ebsworth Park including acquisition of additions to their collections along the way. “I drove Pat Smith to St. Louis and met Elizabeth Lawson out there. Pat and I took a week for the trip, spending a couple of days to drive each way and, of course, stopping at several Antique Malls along the way. The drive from New York to St. Louis and back was mostly straight driving along Interstate 70. We were not pushing ourselves; getting up and one the road by 9ish, making several stops along the way and turning in for dinner and a motel by 7ish. This really did not leave too much time for stopping at antique shops along the way. I decided not to do too much preparation; instead relying on billboards along the highway for large Antique Malls. That was more than enough diversion. We stopped at one place in Springfield, Ohio on the way out called Heart of Ohio Antique Center. We had allocated 45 minutes for the stop. From the Interstate it looked like the biggest Antique Mall I have ever seen. From one end to the other seemed to stretch forever. Once we got inside however, it became clear that we had not seen anything yet. Extending back from this long building were 4 or 5 "wings" that were also HUGE. It was easily 3 times bigger than what we could see from the road. Per its website, it has 116,000 sq ft of selling space, 650 dealers (400 booths and 350 showcases) and 6,000 sq ft for an auction gallery. Needless to say - we needed a little more time. I literally RAN through the place, hardly even stopping and that took over an hour. It was a place to spend several days, at least. Obviously, I couldn't really capture it all and left empty handed. Would love to return sometime. I did get a couple of good deals on the road, however. 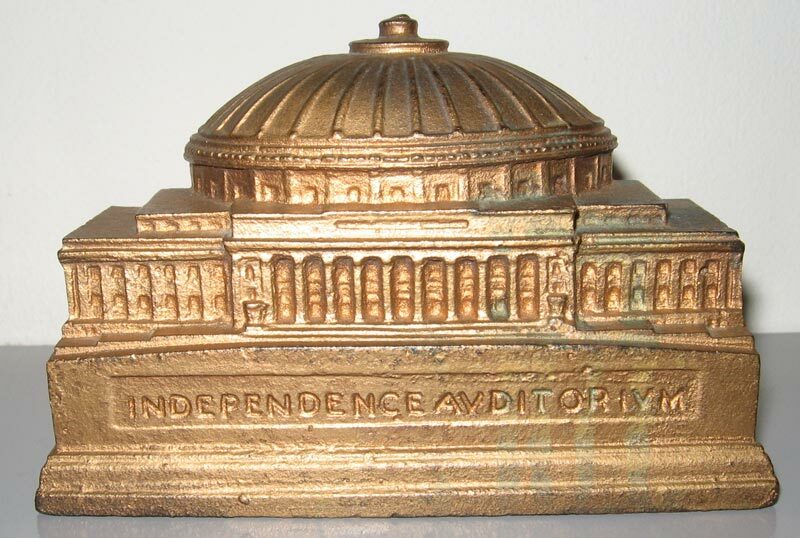 I found an Independence Auditorium coin bank (not the bookends as listed in Monumental Miniatures, but as listed in Cast Iron Building Banks). It was at a small shop called Village Square Antiques in Pocahontas, IL and I got it for under $35 (the dealer gave me 10% off the list price $35 without my asking- LOL). I was telling Jim Redwine about it when he interrupted by saying that it's a great piece to have and usually goes for $200 - $300 - what did you pay for it? I was embarrassed, of course, but told him. He was impressed. On the way back, we stopped at another shop in Indiana and I got a Banthrico Pullman Bank and Trust for $13.50 (no discount!). Also got a glass Fort Pitt inkwell for $25 at a small shop in Illinois and a metal calendar with a collection of D.C. buildings on top for $4. Altogether, I didn't get a lot of stuff, which was just fine with me. “ – Joe Kopitz.